With revised styling and SUV-ish stance, the Mahindra Nuvosport looks more refreshing and sportier than its replacement. The vehicle receives an all-new front fascia, while the rear profile looks more or less similar to the outgoing model. The front fascia the compact SUV features a narrower grille, significantly larger airdam, all-new headlamps, larger air dams, revised bumper, sporty bonnet, chrome surround fog lamps and silver skid plate. The car also sports daytime running lamps that are positioned above the headlights in an eyebrow like shape. While the front of the Mahindra Nuvosport looks completely different from the Quanto’s, the rear profile remains largely unchanged. It gets a new spare wheel cover and clear lens taillights. The side profile is enhanced by black plastic body cladding, roof spoiler and pronounced wheel arches with new alloy wheels. Space, however, is NuvoSport’s strong point. It’s the same as the Quanto, but compared to other compact SUVs, there’s significantly more head, shoulder and knee room all round. Seats are decent too – cushy, large, and decently supportive, and the ones at the rear (which also split and fold 60:40), can be reclined. Also carried over from the Quanto are the two jump seats in the boot. When it comes to safety and comfort, these are pretty much useless. But fold them up, and there’s over 400 litres of luggage space to be had, along with a low loading height. Equipment wise, the NuvoSport gets a multifunctional steering wheel adjustable for rake; height adjustable driver’s seat (there are only two steps – up or down); a multi information display with gear indication, speed, average fuel economy and range; electric adjustment for ORVMs; and a touchscreen infotainment system with AUX, USB and CD compatibility. Conspicuous by their absence are the climate control system; a cooled glovebox and electric fold function for ORVMs. The mHawk 100 comes with a two-stage turbocharger, which tries to kill the lag; but as I said earlier, if the needle slides below 1500rpm, the response time of the engine drops significantly. Mahindra also has a Power and Eco mode in the car, which can be used, as per your driving conditions; so I switched to that mode to see if there’s a difference and there was and a significant one that too. In the Eco mode, the revs are restricted to 3500 rpm and the torque drops, as if it had suddenly discovered gravity. There is a vast difference in the way the car drives, in the Eco mode, as there is less power on offer as well. The engine sips, just the amount required and not any more. It’s as if it goes on a crash diet, at the press of a button (wish Mahindra could develop one for humans as well). Mahindra claims a fuel efficiency figure of 17.45Km/l (ARAI certified); and this, according to the folks there, is not in the Eco mode. Mahindra also says that the NuvoSport can easily do 1000 kms on a full tank and that’s quite a claim. The AMT should make city driving more convenient too. The only irritant about most AMTs on offer currently is the lag between shifts, should you try to accelerate suddenly. But it certainly is a boon for stop and go traffic, and the NuvoSport should feel perfectly at ease even in bumper to bumper traffic. Gathering speeds is easy with the nifty bottom end performance of the engine which feels smooth, while NVH levels inside are well controlled. Underpinning the NuvoSport is Mahindra’s 3rd generation chassis, from the current Scorpio and is a body on frame unit. This is huge leap forward compared to the Quanto’s chassis and changes in handling were visible even on our rather short time drive. Body roll is a lot more controlled, and the NuvoSport feels confident changing direction quickly, which wasn’t the case with the Quanto. The double wishbone and coil spring suspension upfront and multilink suspension with coil springs have been tuned by Cayman, and the balance between ride and handling was instantly noticeable. The Mahindra NuvoSport offers dual front airbags with ABS as standard across all the variants except the basic N4 trim but safety features come optional with this trim. It comes with an OE warranty of 1,00,000 kms or 3 years. Mahindra has a good reach across the country with a strong network. Maintenance cost is relatively low but you never know with a Mahindra car how frequent visits would you make to the service centre with the unpredictable electronics of their UVs. So, the Quanto is ready for its second coming and this time Mahindra has given it a lot of thought – it shows in the price as well. The NuvoSport starts at ₹ 7.35 lakh and tops out at ₹ 9.76 lakh (ex-showroom, Thane); the company has positioned it above the TUV300. With more features and an AMT, as NuvoSport’s USP, the consumers are now spoilt for choice, in the sub-compact SUV segment. 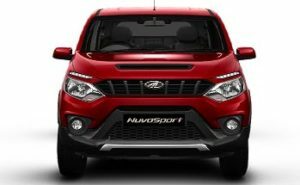 However, NuvoSport competes against the likes of the new Maruti Suzuki Vitara Brezza, Ford EcoSport and even its own sibling – TUV300 – in this space, but doesn’t really stand out as a distinct front runner. What it does, though, is make it more competitive. Just like we accept actors, who take their roles seriously, by going through transformations, the NuvoSport has gone through something similar, which could make this effort worth its while!